758 will be celebrating its 53rd Annual Ceremonial Review on June 9, 2018 at Chinguacousy Curling Club. This parade is MANDATORY for all cadets. The ACR is a formal parade to showcase and celebrate the past training year. Awards are presented, speeches are conducted, and it signifies the end of another successful training year. Friends and family are more than welcome to attend. Our Reviewing Officer for the parade will be Lieutenant-Colonel T.W. Heuthorst, CD. 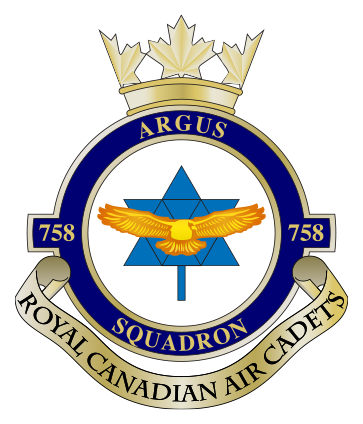 LCol Heuthorst is a former cadet of 758 Argus and currently the Directing Staff at the Canadian Forces College. Cadets will be required to attend one final parade practice at the curling club on Friday June 8, 2018 (usual Monday evening timings) in civilian clothing (wear comfortable shoes!). On the 9th, we ask that cadets arrive between 0815 and 0830 hrs, also in civilian clothing but with their uniforms on a hanger and clearly marked with their name. Uniforms must be clean, pressed, and ready to go. Boots must be polished to a high glossy shine. Males will be clean shaven and have proper hair cuts. Sikh males who wear a turban shall be wearing their issued turban. Females will arrive with their hair already done, no nail polish or heavy makeup, and no costume jewelry. Lunch will be provided by the squadron for the cadets but they should eat a healthy breakfast prior to arriving in the morning. Guests are asked to be seated no later than 1245 hrs. The parade will begin promptly at 1300 hrs (1:00 PM) and will last 90 mins. There will be a short reception following the parade with some light refreshments and static displays in the cafeteria for about 30 mins. Cadets will not be dismissed until the parade square has been cleaned up.